Skype is known for its service for VoIP phone call between computers and between computers and regular phonelines. Before now, Skype app works over WiFI for Apple iPad, iPhone, and iPod touch but not over mobile 3G. A few apps already allow VoIP phone calls over 3G on iPad / iPhone, to save people from using typically limited voice minutes while on cellular network. But now, Skype just released an update of its app [itunes link] to work over 3G using data, as an inexpensive option to a voice plan. 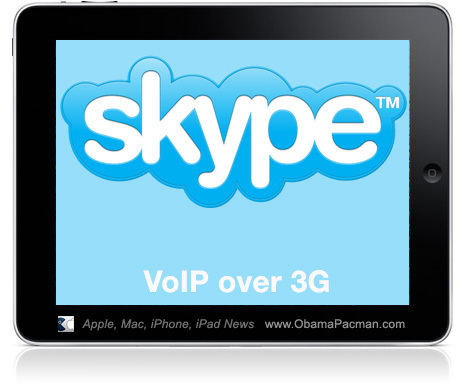 Skype indicates it’s 3G VoIP service between Skype clients is free until the end of August. Data charge might apply but those with unlimited mobile Internet data plan don’t have to pay for data usage. The new Skype app makes possible phone calls and unlimited Internet on iPad 3G for the non-contract price of $30 per month. Might be of interest for some people. Just use a headset with microphone, otherwise it might look a little odd holding up an iPad to the face. By the way, Skype is not available for Windows mobile WiMPs due to the poor user experience of the Microsoft platform. This entry was posted on Monday, May 31st, 2010 at 11:00 pm	and is filed under iPad, iPhone Apps. You can follow any responses to this entry through the RSS 2.0 feed.